The history of the Creel-style Purse Nantucket Basket began over a hundred years ago when the creel-style baskets were originally used for storing and transporting fish from the fishing boats on the East Coast. 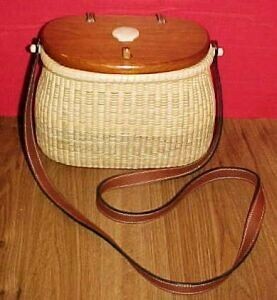 In 1982, Darryl Arawjo designed the first Nantucket creel-style (purse) handbag basket, the Arawjo Signature Handbag ($575 in 1992). He wanted a purse style and design which was original, with a one-hand latch system, the classic Nantucket design, and a style that would look great on women of all ages, complementing any outfit, from jeans to evening wear. Darryl was commissioned to make a "Presidential Creel" for President George W. Bush in 1990. My Presidential Creel Purse Nantucket Basket is based on the original Nantucket Basket Creel Purse, with a solid cherry wood base, hand-tapered and beveled cane staves, fine cane weaving, and a solid-cherry wood lid with a cherry wood one-hand latch system. The traditional reed rims have been symmetrically nailed with thin brass escutcheon pins. This Presidential Creel Purse Nantucket Basket incorporates an elegant double-chevron design in the weaving on the front which lends a contemporary touch to this classic purse! An optional personalized ivory quarter-board, which is traditionally attached to the inside of the Nantucket Basket lid, is available for an additional $125.00. This board can be engraved with a first name, middle initial and last name. This Nantucket Basket features a high-quality stitched leather shoulder strap and stitched leather hinges. A braided leather shoulder strap is also available at no additional charge. Bone, Ivory or Ivory Scrimshaw knobs and washers and a bone or ivory carved scallop shell or whale carving completes the Presidential Creel Purse Nantucket Basket. The Presidential Creel Purse Nantucket Basket measures 11" long x 6" wide x 7" high at rims. The base of the Nantucket Basket Creel Purse will be signed and dated. Although I am no longer accepting orders for the Presidential Creel Purse Nantucket Basket, I do craft one or two of these per year. When its ready for sale, you can purchase it directly from my Simply Baskets website.